The inaugural Legacy Fighting Alliance card is here, and it’s looking to be an exciting one. 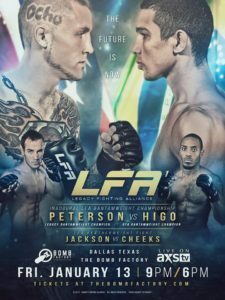 Headlining the card, a bantamweight title unification bout between RFA champion, Leandro Higo (8-2), and LFC champion, Steven Peterson (14-4). Higo is currently on a 3-fight winning streak, with his most recent win being a submission victory over Joey Miolla at RFA 37 where he captured the RFA Bantamweight title. Peterson is undefeated in his last 6 bouts, winning the LFC Bantamweight title at LFC 56 when he stopped Manny Vasquez in the 4th round. In the co-main event, Fury FC Lightweight Champion Charles Cheeks (11-4), takes on UFC and Legacy vet Damon Jackson (10-1-1). Cheeks has not fought since June 2016, where he won the Fury FC title. Jackson, on the other hand, got a decision victory at Legacy 61. Check out the rest of the fight card below. The main card will air live on AXS TV at 9 pm CST.